I’m back! After a week of Spring Breaking (i.e. working and not-cooking), I have returned to supply you with mediocre pictures of stellar food. I missed you all. I missed blogging. I missed the instant gratification of someone pinning something from my blog. But, alas, I’m back and Goat Cheese is making a return appearance with me. This sammy was inspired by what-we-had-in-the-fridge ingredients and when I saw goat cheese, well, you can’t just waste something like that. I would’ve added spinach had we had some tucked away in the crisper, but beggars can’t be choosers. If you don’t eat cheese or don’t like it, substitute some fresh pesto for the spread! Also, I was much too lazy to pull out the panini press. It is a Monday after all. 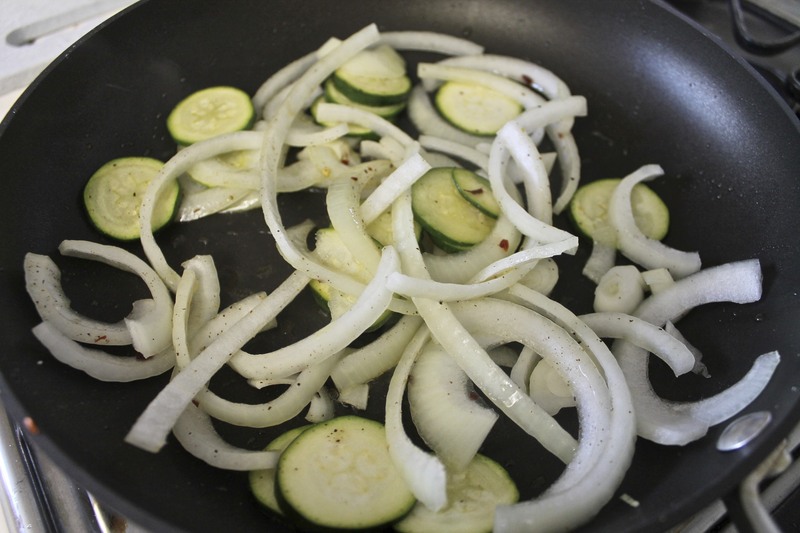 In a large, shallow pan, drizzle a little bit of EVOO (about a tablespoon) and throw in the sliced zucchini and onions. Cook down on medium heat for about 5 minutes. 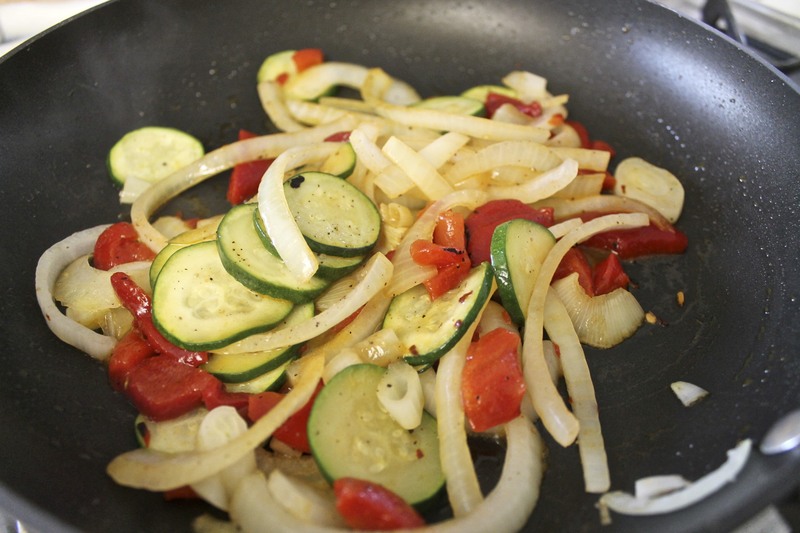 Add the roasted red bell pepper and season the pan contents with the salt, pepper and crushed red pepper, if using. Let cook for another 5 minutes, occasionally stirring. 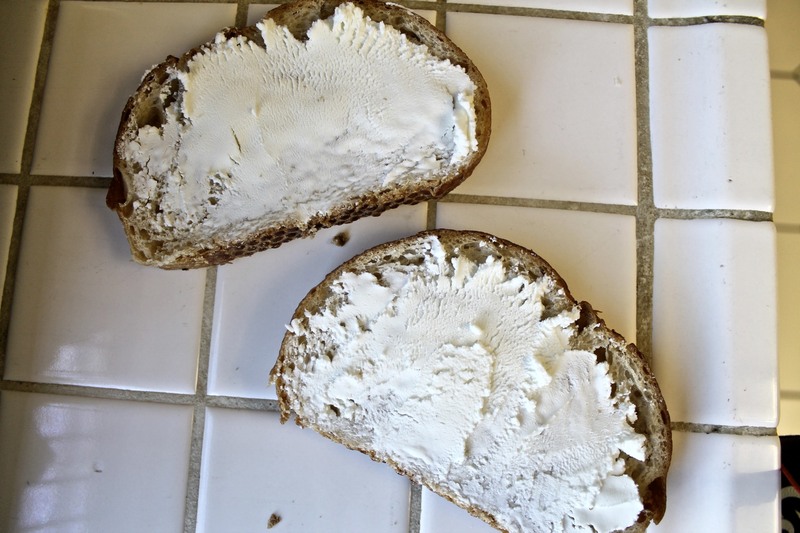 Meanwhile, spread the goat cheese on the inside of each piece of sourdough. 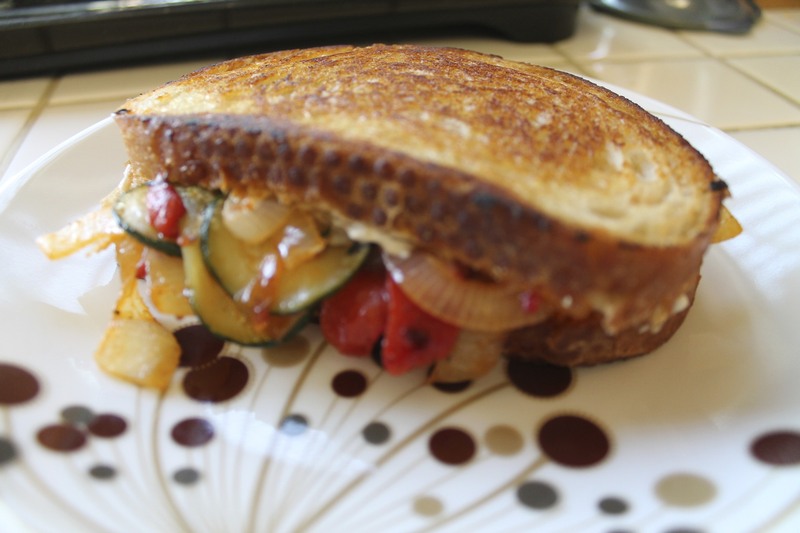 If using a panini press, turn it on and get it up to medium-high heat. 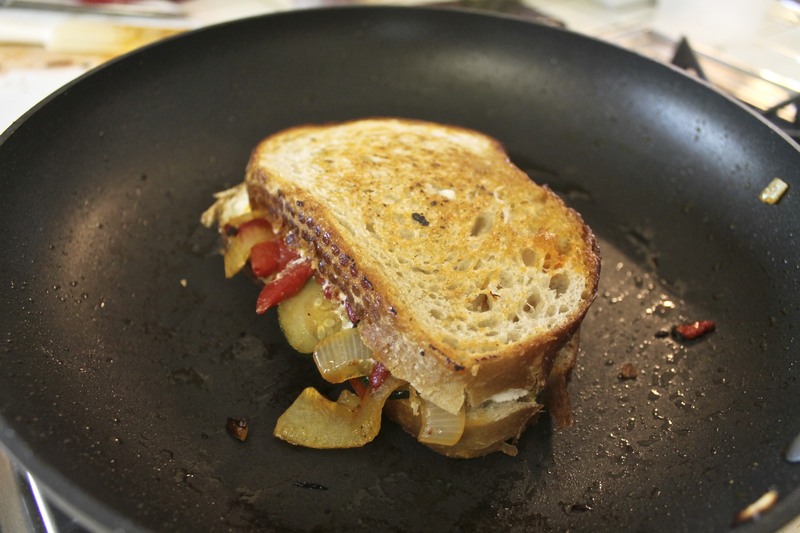 Once the veggies have cooked down and onions are softened, remove them from the pan and pile them high onto one slice of the bread. 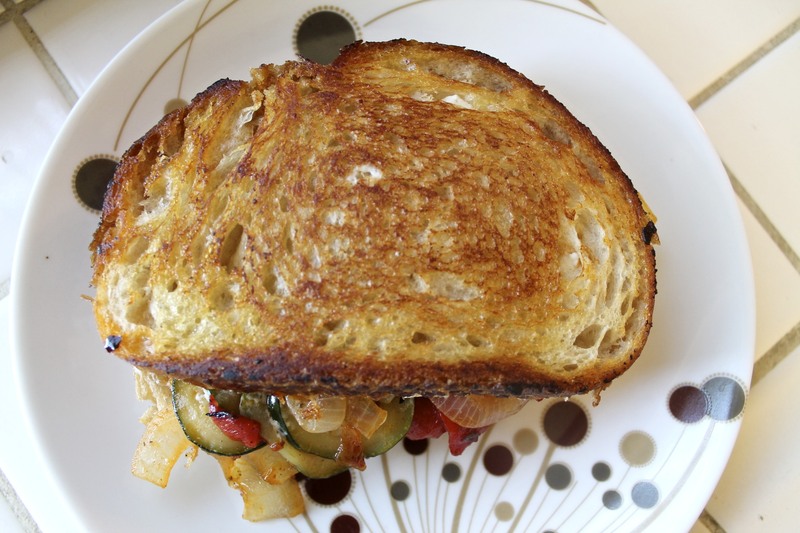 Top off with the other slice of bread, drizzle with EVOO and sandwich it into the panini grill until cooked, about 5 minutes. 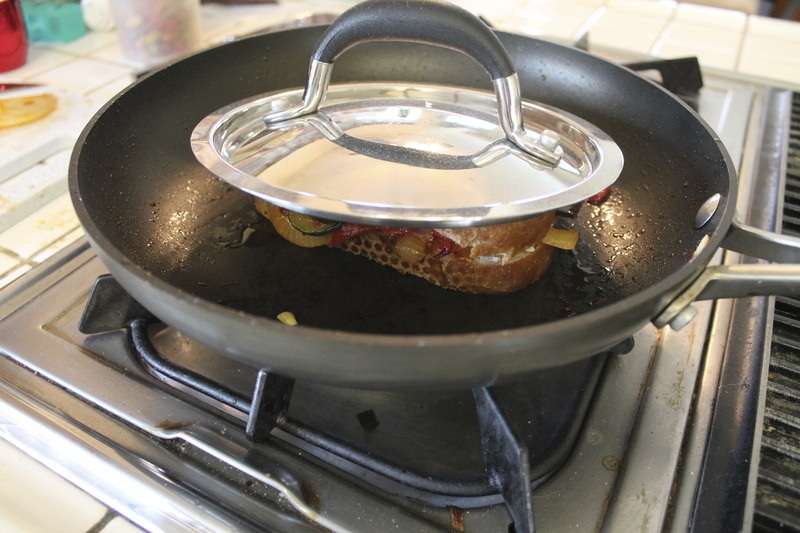 If you don’t have a panini press, simply stick the sandwich back into the same pan you cooked the veggies in and smoosh it down with a griddle pan or the lid of another pan. 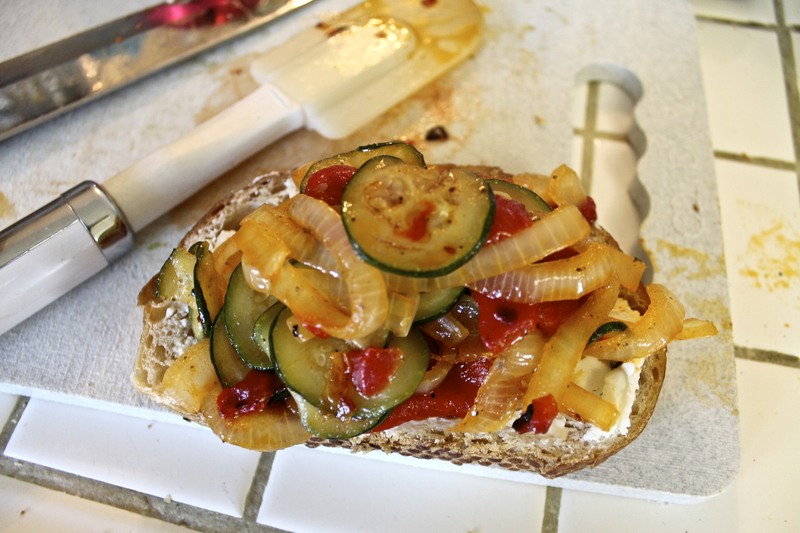 Make sure you put some EVOO on the top slice of bread so it doesn’t stick to the lid. Cook for 2 minutes, then flip over, squish again and cook for another 2 minutes, or until golden brown. Eat with your favorite kettle chips or pasta salad. There you go! An easy and light Monday dinner that’s satisfying without the meat. Who says sandwiches are lunch-food only? Add spinach and cook it down with the rest of the veggies. Add artichoke hearts and kalamata olives for a mediterranean twist. You could even switch out the goat cheese for feta. Use peso instead of cheese. 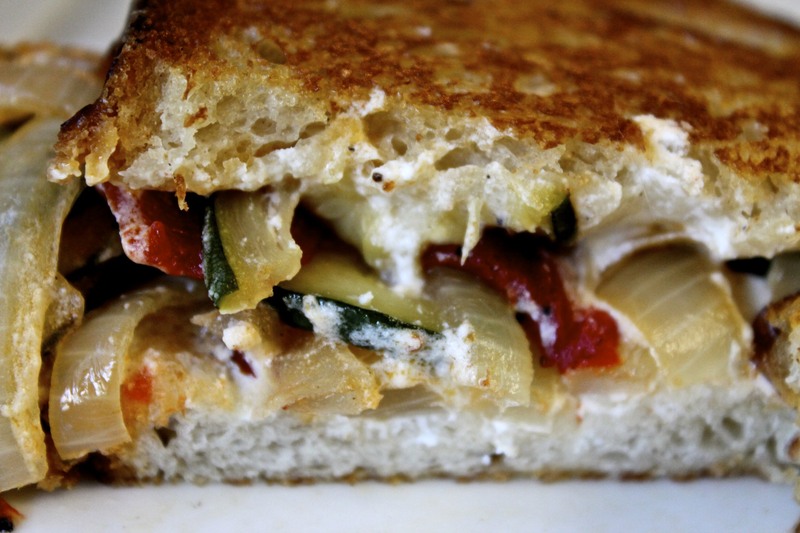 Use provolone instead of goat cheese. Try it with hummus or avocado.